Dairy Queen has a variety of specials promotions and deals each month! Dairy Queen is popular for their ice cream and dessert menu, but they also have fast food such a cheeseburgers and chicken sandwiches. Their most popular item is probably the DQ Blizzard, which is flavored soft serve ice cream paired with your favorite toppings. 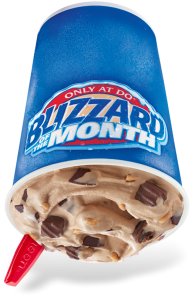 They have a Dairy Queen Blizzard of the Month promotion where each month they feature a different Blizzard at a special price. In addition to the Blizzard of the Month they also have a Blizzard Cake of the Month promotion which puts one of their delicious cakes at a promotional price. The choices for their Blizzard and Blizzard Cake of the Month are usually based upon the season and make references to holidays such as Thanksgiving or Christmas.